Thought I'd post my first contribution to this section with a presentation of some solar astrophysics. I have constructed a spectroheliograph (SHG) which I use to image the solar disk in various wavelengths. There is a description of the device in Ken Harrison's book as well as more detailed articles in the August 2015 issue (volume 109) of the Journal of the Royal Astronomical Society of Canada and forthcoming publications of the Sonne and Spektrum magazines for German solar observers and spectroscopists. The device is, essentially, an imaging spectrometer and can be used for spectroscopic studies as well. Here, I am presenting an analysis of Zeeman broadening of the Fe I 6302.5 Angstrom spectral line to measure the magnetic field in the vicinity of a sunspot. Please use the links to see better quality images. Figure 1 shows a spectrum recorded on the solar disk as captured on the camera frame. The region of interest (ROI) enclosed in the red box contains two Fe I lines of interest (6302.5 and 6301.5 Angstroms) and two telluric oxygen lines. Other possible lines in the ROI are treated as negligible. For this study, the SHG consisted of a 1000mmf f/10 catadioptric objective lens, 10 micron slit, 500mmf collimating lens, 2400 g/mm holographic grating and 600mmf camera lens with PGR USB3 Grasshopper camera (ICX694, 1", 2736px X 2192px, 6Mpx sensor). The observation was subject to mediocre seeing conditions and, consequently, the results presented here are based on a single frame chosen out of 1100 using visual inspection and the quality sorting capability of AviStack2 software. 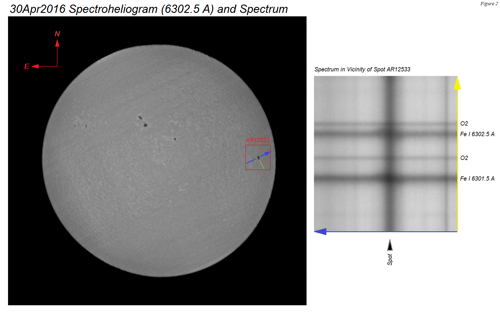 The spectral ROI is magnified in figure 2 with a sunspot present (vertical dark bar). This image was averaged over 4 pixels in the spatial direction and two pixels in the dispersion direction before being used to generate the measured (non-zero field) spectra discussed below. The sunspot under study is shown in the accompanying spectroheliogram (produced at 6302.5 Angstroms) in figure 2. Dispersion direction (yellow line) and slit position (blue line) are shown on the spectroheliogram. Broadening of the two iron lines near the sunspot can clearly be seen and this is attributable to the Zeeman effect. The Fe I 6302.5 Angstrom line is especially interesting. In the presence of a magnetic field, the single absorption line in zero field "splits" into three distinguishable lines, a central "pi" component and two symmetrically located "sigma" components, the classic Zeeman triplet pattern. The wavelength splitting between the two sigma components is proportional to (linear Zeeman effect) and determined by the magnetic field strength. To give an idea of what to expect, simulated Zeeman line patterns were calculated (figure 3). These were generated in OriginLab Origin 8.1, using Voigt spectral line profiles and (eta_0=1) relative intensities from equation (5.17) of Bray and Loughhead (R.J. Bray and R.E. Loughhead "Sunspots" v.7 The International Astrophysics Series, Chapman and Hall Ltd. 1964). Red curves show the simulated pi component, green curves show the simulated sigma components and the black curves show the overall Zeeman line pattern. In figure 3, the variation across a row is given by various values of the angle gamma (in degrees) between the magnetic field direction and the observer's line of sight (LOS). For gamma=0, the field is along the LOS (longitudinal Zeeman effect) and for gamma=90, the field is transverse to the LOS (transverse Zeeman effect). The difference between the upper row and lower row is the strength of the magnetic field, expressed as the sigma splitting (delta-lambda_sigma) in terms of the Voigt profile linewidth (W_v). In principle, the shape of the Zeeman pattern can be used to obtain information about the orientation of the magnetic field as well as its strength. Figure 4 shows a four component Voigt fit to a "field free" (quiescent disk) spectrum measured far from the sunspot. The spectrum was averaged over 170 pixels in the spatial direction. 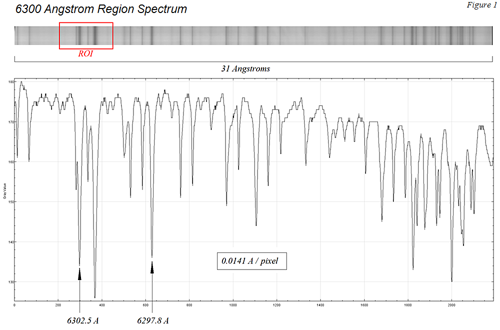 This spectrum and the measured spectra described below were analyzed with the non-linear curve fitting routine of Origin 8.1, using Voigt line profiles. 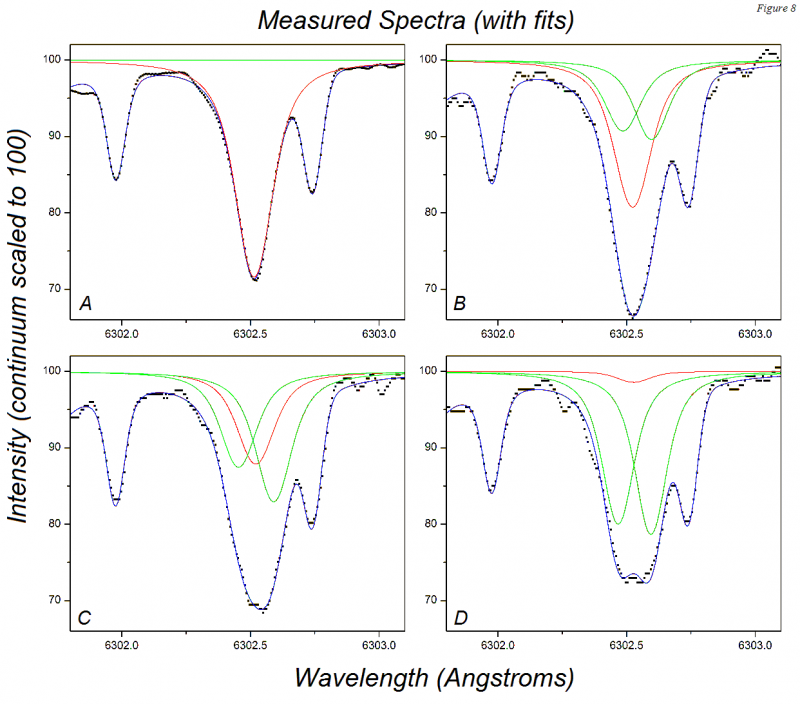 The field free spectrum fit established the positions (line centres) and linewidth parameters for the telluric O2 lines and the Fe I pi lines and served as a basis for analyzing spectra (measured close to the sunspot) in which the field was non-zero. Fitting of the field-free spectrum was very straightforward. Four line positions were roughly identified in the initial parameter set and the fit automatically converged to the final result without difficulty. The fitting of the field-free region also allows a quite reasonable estimate of the resolving power of the spectroscope. The two telluric O2 lines give fitted widths of 0.083 and 0.087 Angstroms for an average width of 0.085 Angstroms, corresponding to a resolving power of 74000. In figure 5, the field free case is reproduced in figure 5A while spectra 5B to 5D were measured at locations progressively closer to the sunspot centre. (Figure 7 shows these locations exactly.) Red curves show the fitted pi component, green curves show the fitted sigma components and the blue curves show the overall curve fit. As mentioned above, the O2 lineshapes and positions and the Fe (pi) positions were held constant (at least initially) in the fitting of the remaining spectra. 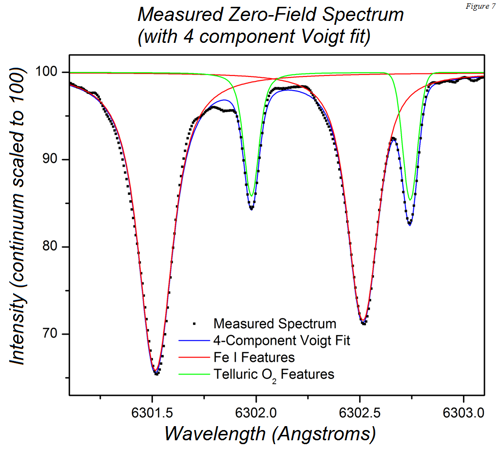 The spectra for non-zero field were assumed to contain contributions from the (unresolved) Zeeman triplet so the fitting procedure was more complicated and involved a total of six fitted lines (Fe I 6301.5 A, two telluric lines, Fe I 6302.5 A pi and two sigma components). No attempt was made to resolve the Zeeman splitting of the Fe I 6301.5 A line which is magnetically sensitive, but to a lesser extent than Fe I 6302.5 A line, and also arises from a more complicated atomic transition. 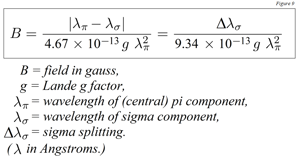 The six component Voigt fit required multiple iterations in setting initial fit parameters and involved "nudging" the fitted solution away from unreasonable, unexpected outcomes like vastly different sigma component intensities, or big displacements of pi line positions. However, the sigma component wavelength splitting, which determines the magnetic field strength, was very robust to the procedure and gave consistent values, regardless of the way in which initial fit parameters were chosen. The sigma component splitting was converted to a magnetic field strength using the equation of figure 6 with a Lande g factor of 2.5 for the Fe I 6302.5 A line. With regard to spectral fitting, the paper of Hughes et al. (Hughes, Anna L. H.; Harvey, Jack; Marble, Andrew R.; Pevtsov, Alexei A. 2013 "Zeemanfit: Use and Development of the solis_vms_zeemanfit code", eprint arXiv:1312.2026) makes fascinating reading! It is very interesting to find that, sometimes, rather arbitrary choices are made about appropriate lineshapes and constraints on fitting parameters even for the analysis of professional NSO - SOLIS (National Solar Observatory - Synoptic Optical Long-term Investigations of the Sun) data. 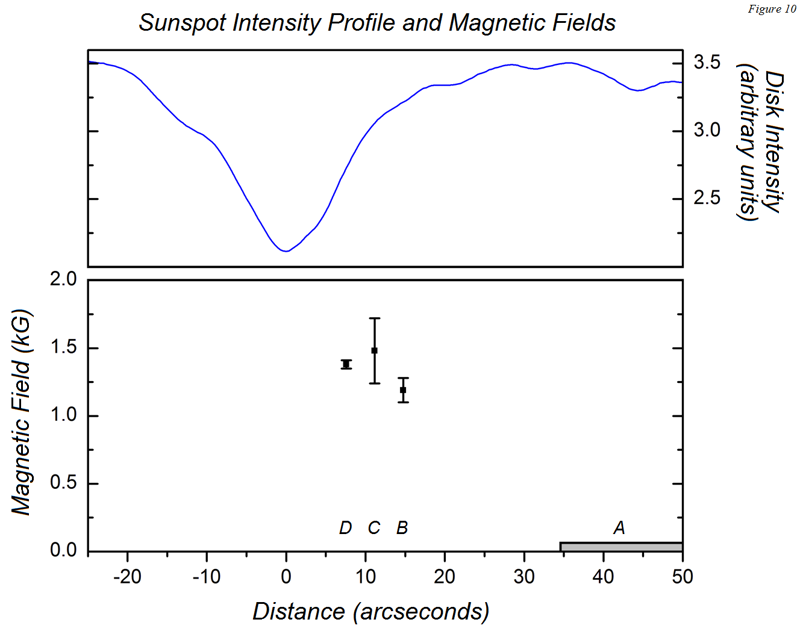 Figure 7 shows the results of the magnetic field measurements plotted together with the intensity profile of the measured spot as measured along the blue line (slit position) in the spectroheliogram of figure 2. Field strengths determined by spectral fits to spectra 5B, 5C and 5D are labelled by B,C and D in the figure. The field free region is identified by the letter A and corresponds to the gray shaded region. The average measured field, within 15" of the spot centre, was 1.35 kG. This result is consistent with a prediction from the formula of Houtgast and van Sluiters (J.Houtgast and A.van Sluiters  Bull.Astron.Inst.Netherl. V10, p235) relating sunspot area to maximum field: Bmax = 3.7A/(A+66) with sunspot area in units of 1E-6 of the solar hemisphere and Bmax in kG. For the measured spot area of 58E-6 (estimated from the spectroheliogram in figure 2), we expect a maximum field strength of Bmax = 1.7 kG. By comparing the simulations of figure 3 with the fitting results of figure 5, it's also interesting to note that the spectrum fitting yields a nearly longitudinal Zeeman effect nearest to the spot with an increasing transverse Zeeman character (growing pi component) as distance from the spot centre increases. This is consistent with the classical picture of the field direction in a spot shown in figure 8. I am less confident in making conclusions based on the fitted line intensities because these had an uncertainty of up to 50% for small values. I intend to revisit this type of measurement as soon as possible. The field measured here was of medium strength and manifested itself as a broadening of the Fe I line rather than a clearly observed splitting. The resolving power of the spectrometer is sufficient to resolve the splitting for stronger fields (> 2kG) so bigger spots should be examined. Also, the "seeing" issue was critical. The analysis above is based on a single video frame taken under conditions of poor to mediocre seeing which is definitely "non-ideal"! In the future, I expect to apply a more complete video frame analysis, through AviStack2, and attempt to stack frames. I also intend to use active solar guiding which would greatly benefit the acquisition of a spectrum at a chosen point on the solar disk. Feel free to leave comments or ask questions. Thanks for reading! Edited by Peter Z, 03 April 2017 - 10:52 AM. Excellent results. I've been having a lot of fun with low resolution spectroscopy. What do you think is the minimum resolution for spectroheliography? Jim: I'm fortunate to have access to some pretty powerful software (Origin 8.1) for spectrum fitting. I don't think I would have had much success measuring a Zeeman effect without it ... not with the relatively ratty spectrum I had taken. This exercise was, more or less, a proof of principle. Next time I'll pay more attention to the acquisition of the spectrum, especially using some solar guiding.